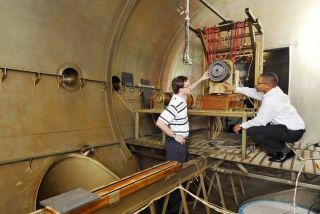 Georgia Tech assistant professor Mitchell Walker and graduate student Logan Williams examine a 10-kilowatt Hall effect thruster during research to develop a better ion drive. Spacecraft have used ion drives to explore the moon and deep space, buta new study aims to boost the electric propulsion idea to keep satellitesaround Earth alive longer. Researchers are working to develop newion thrusters that can harvest vital electrons from electrified carbonnanotubes, rather than from precious xenon gas propellant. Less wastedpropellant means that satellites can launch on smaller rockets, carry biggerpayloads or stay in orbit for longer. "It can add an extra year of life to a satellite," said JudReady, a materials engineer at the Georgia Institute of Technology. "That's not inconsiderable for a satellite that lasts 10 years orless." More efficient ion thrusters could also benefit space missions beyondEarth orbit. Europe's SMART-1 lunar orbiter used them to maneuver up until itslammed into the moon in 2006, while other spacecraft use them today, includingNASA?s Dawn probe heading out to two asteroids and Japan?sailing Hayabusa, which is limping home from its own asteroid rendezvous. The research stems from a $6.5 million grant by the United StatesDefense Advanced Research Projects Agency (DARPA) and is aimed at building a betterion thruster for spacecraft. DARPA?s interest lies in the growing swarm of U.S.and Russian satellites that rely upon ion thrusters to maneuver in space, sincethey typically sacrifice 10 percent of their propellant supply to create the electronsthat ionize the rest of their propellant. The researchers are focusing their effort on so-called Hall effectthrusters, which are used today in at least a dozen U.S. satellites and manyRussian satellites. These ionthrusters typically have a single, hollow cathode that holds part of thepropellant used for creating electrons. The new DARPA-funded approach replaces the hollow cathode with a wholecathode array made of carbon nanotubes, basically super-tiny tubes made ofcarbon. A low electric field that draws power from solar cells and on onboardbattery would help strip the electrons from the nanotubes. Nanotube cathode arrays could not only boost efficiency, but also createlayers of redundancy that improve hardware reliability ? a crucial factor inspace where repairs range from extremely difficult to impossible. The researchteam used multi-walled carbon nanotubes rather than single-walled nanotubes inthat spirit. "A multi-walled carbon nanotube is a lot like an onion or a Russiannesting doll," Ready told SPACE.com. He added that their nanotubeshave about 10 walls, so that holes in one or two would not render the cathodearray useless. Having nanotube arrays also adds another layer of redundancy, sothat the loss of a few nanotubes does not mean total failure. Different material coatings on the nanotubes can even act as electronmultipliers that boost electron harvesting efficiency. One electron thatstrikes the coating could generate two electrons in an effect similar to achain reaction. The smaller size of the new cathode arrays also means that engineers canplace them in a circle within the ion thruster. That would allow a satellite tocontrol its directional thrust by simply running the cathodes on one side. Such simplicity translates into greaterreliability compared to current ion thrusters, said Mitchell Walker, anaerospace engineer at the Georgia Institute of Technology and lead investigatorfor the project. "The current design relies on servomotors and joints, but each oneis a possible failure point," Walker explained. "There are no movingparts with the non-mechanical way, and you get the same impact." The nanotubes have already undergone simulated launch testing at theU.S. Army's Redstone Arsenal in Alabama. The vibration table tests shook a fewnanotubes loose, but that reinforced the idea that having redundant systemswould allow the ion thruster to keep on running. Walker and Ready next plan to gauge the performance of the new cathode arraysin a Hall effect thruster over the next year and a half. A third researcher, LisaPfefferle of Yale University, has lent her chemical engineering expertise tohelp harden the carbon nanotubes against the harsh space environment. If all goes well, a satellite carrying the new ion thruster could launchfor space testing in 2015.